The Cornwall Golf and Country Club features a fully stocked pro shop that caters to all your equipment and apparel needs. We stock an extensive selection of the latest golf equipment, apparel, and accessories at competitive prices. Our RCGA Professional offers lessons that will help you work on the various aspects of your game, or help you get started if you are just beginning to play the sport. The Pro Shop also provides a full repair service for grips and shafts, as well as professional fitting for that set of new clubs. In addition, we stock a full line of golf equipment, mens’ and ladies’ clothing, bags, shoes, accessories and gift items. The quality brand names we carry include Titleist, Ping, Footjoy, ClicGear and Golf Buddy. Stop in soon and let our experienced staff assist you in satisfying all your golfing needs. The Pro Shop at the Cornwall Golf and Country Club is your one stop shopping place. The golf club offers its members a practice putting green a short distance from the first tee and a driving range a few yards further. The 250 yd+ driving range is set up with an elevated grass teeing area. A practice sand trap gives you a chance to brush up on those escape shots before you start your game. Range balls are complimentary. 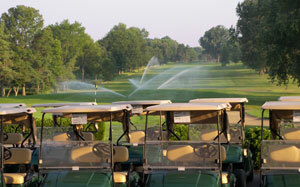 Forty electric golf carts are available for rent to make your day on the course more relaxing. Walkers are welcome and the course is a good workout but very manageable. Pull carts are also available at no charge. Men’s Locker Room – The Men’s Locker Room located on the main floor of the clubhouse includes lockers, showers and washrooms. It is immediately adjacent to the pub, a convenient post-game stop. Women’s Locker Room – The Women’s Lounge and locker room is located on the second level and includes a well-appointed sitting room overlooking the course. Lockers are available as well as showers and washrooms. This area is accessible by stairs from both inside and outside the Clubhouse.